For those of you who read my blog entry last year around this time, you know that I had attended the first annual Heirloom Expo at the Sonoma County Fairgrounds in Santa Rosa last year. 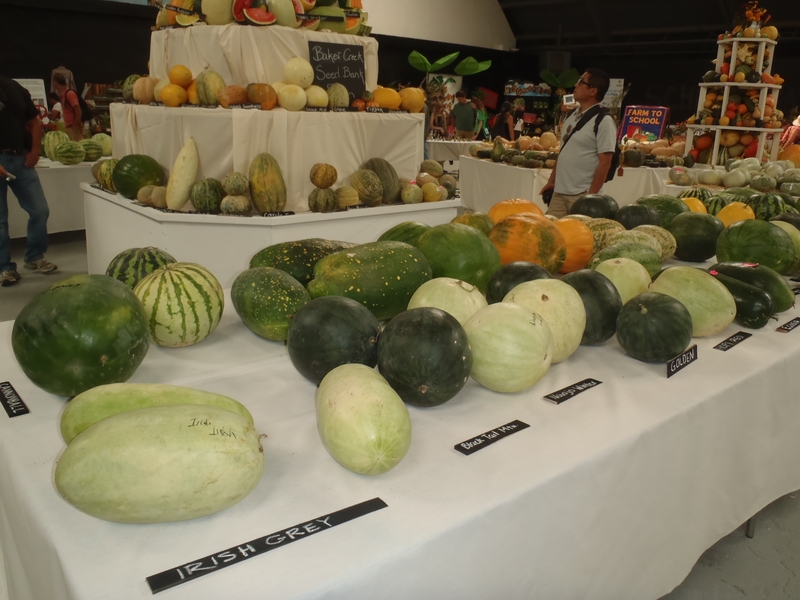 Having trouble keeping away, I attended the Heirloom Expo again this year on September 11, 2012 (the Expo usually runs for 3 days in early-mid September, from Tuesday to Thursday). It was just as well organized and entertaining, as it was last year. What made it especially memorable this year, was because some of the heirloom vegetables on display were grown and harvested by my former neighbor (see the pics featuring melons and eggplants). 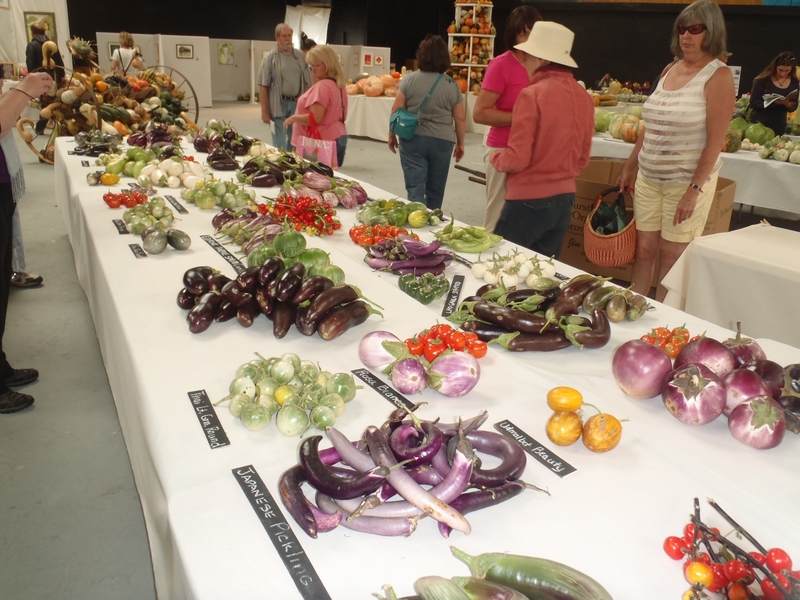 To clarify, the Baker Creek Heirloom Seed Company has a research plot just 2 doors down from where I used to live in Suisun Valley, and it is there that they grew umpteen varieties of eggplants and melons which they displayed at the Expo. 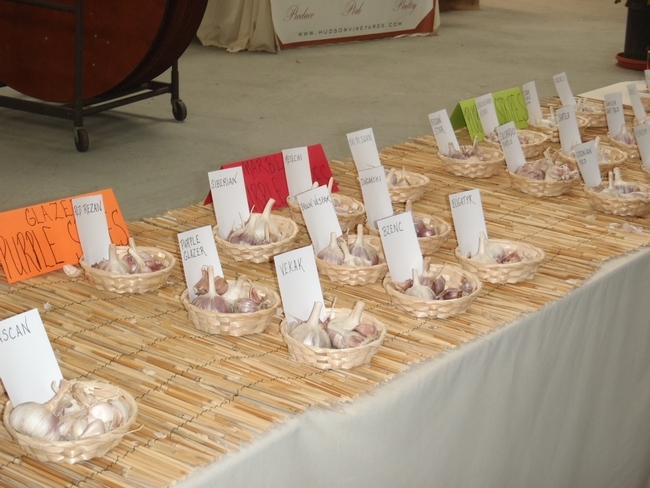 One of the vendors at the Heirloom Expo, was Paul Palmer of the Los Olive Homegrown Gourmet Garlic company (aka the “Garlic Guy”) located in the San Ynez Valley, which grows, according to an August 2010 blog post by the company, over 61 varieties of rare garlic (see pics). Check out Paul’s website here-http://www.garlicguy.net/99639385, which contains sample photos of some of the amazing varieties he grows. I spoke with Paul regarding what his secret was to successfully growing garlic, and he told me that he amends his soil with at least 25-30 tons of high quality compost per acre. Now most of us city-dwelling garlic lovers do not have an acre to do what Paul does, but we can take that same principle and scale it down to our backyards (where we can exercise greater control over our growing environment than on a farm) and produce some amazing, beautiful, and rare garlic every year which you can then save and trade with friends and family, and replant each year. As for me, I grow garlic each year and have found success in growing several varieties such as German Hardneck and Ichelium Red. This year, in addition to the Ichelium Red, I will be planting seed garlic from Paul, varieties which include Spanish Morada (hot), Spanish Benittee (hot), Thai Purple (less hot), Red Razan (medium, all-around variety) and Fabermadour (a baking garlic which, according to Paul, is good for spreads). I will report back the results next June when I harvest! This weekend, I had the pleasure of visiting Wild Boar Farms in Suisun Valley. Wild Boar Farms is certified organic by CCOF and their specialty is growing and breeding unusual and tasty varieties of heirloom tomatoes. 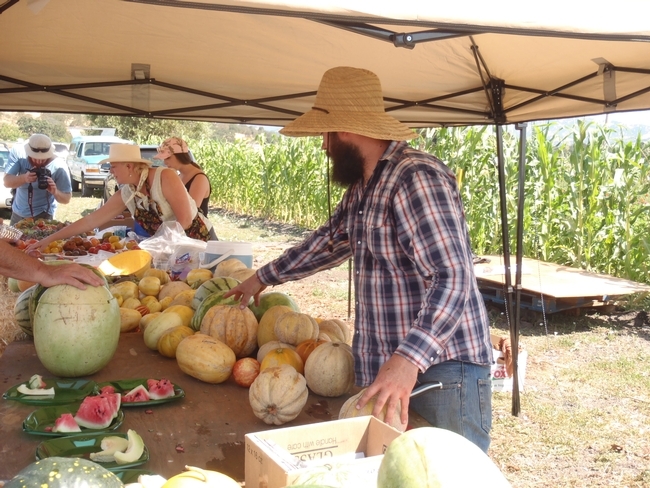 The day began with sampling various varieties of tomatoes grown at Wild Boar Farms and melons grown on an adjacent plot leased by Baker Creek Seeds. There was also wine tasting available. Thereafter, the proprietor of Wild Boar Farms, Brad Gates, led attendees on a tour of his farm. Of particular interest, were his research fields where he is experimenting with breeding different varieties of tomatoes, including one containing anthocyanin, a water-soluble pigment which gives blueberries their blue color. 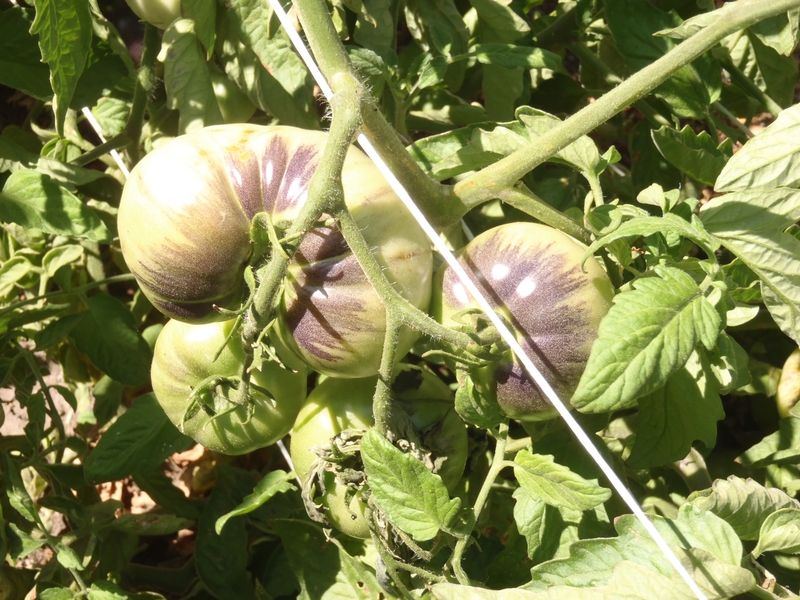 In this case, anthocyanin imparts a bluish hue to Brad’s experimental tomatoes (see picture below). 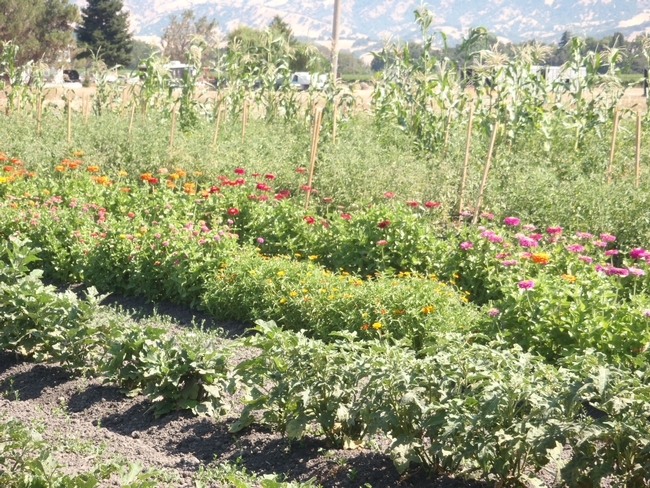 After Brad concluded his tour, Christian Dake of Baker Creek Seeds, led attendees on a tour of the Baker Creek Seeds plot, where he showed us all the varieties of heirloom vegetables (eggplants galore! ), melons, and flowers that Baker Creek Seeds intends to showcase at their upcoming Heirloom Expo at the Santa Rosa Fairgrounds, which runs from September 11 to 13, 2012 (see pictures below). The day concluded with a wonderful lunch prepared by Fume.